NEW! : The BraaiBoytjie has been upgraded! You can now personalize your BraaiBoytjie with ANY name! 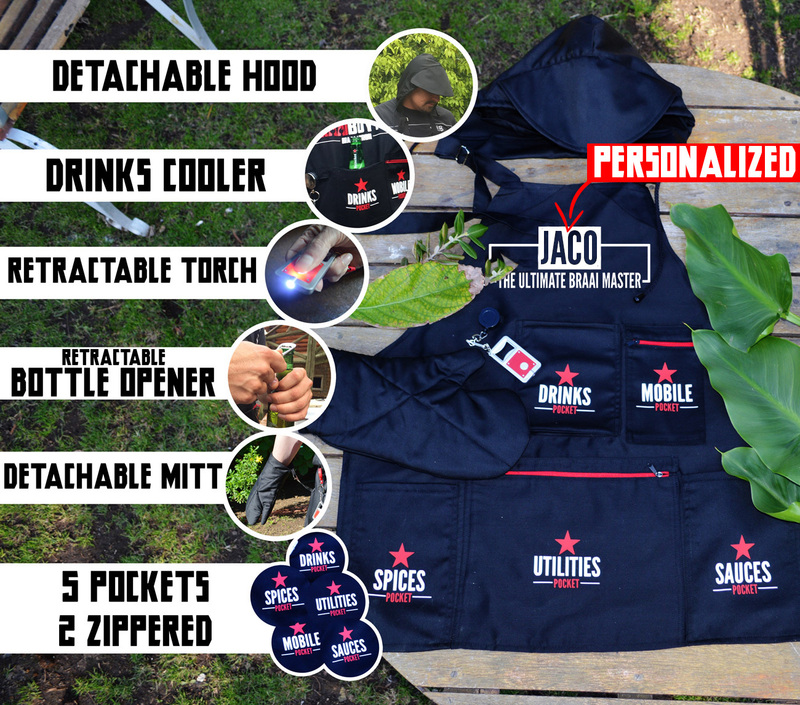 BraaiBoytjie is the ultimate braai apron that's packed with everything you'll ever need in a braai apron and more! It's not just your ordinary apron, it's your new braai companion! Bottle Opener and Torch - BraaiBoytjie comes with a retractable bottle opener and torch that stretches and expands on a wire for maximum reach. Drinks pocket with aluminum foil inside cooler to ensure your drinks stay cooler for longer. 3 Open pockets and 2 zipped pockets to ensure there's enough space for you to fit everything you need into the pockets you need them to go into. Detachable heat-resistant mitt glove for when you need to handle the heat. Attachable/detachable hood cap - a hooded cap at the back of the apron to keep you shielded from the sun or rain. Can be attached or detached at any time via velcro patches. Adjustable neck strap to ensure the perfect fit.